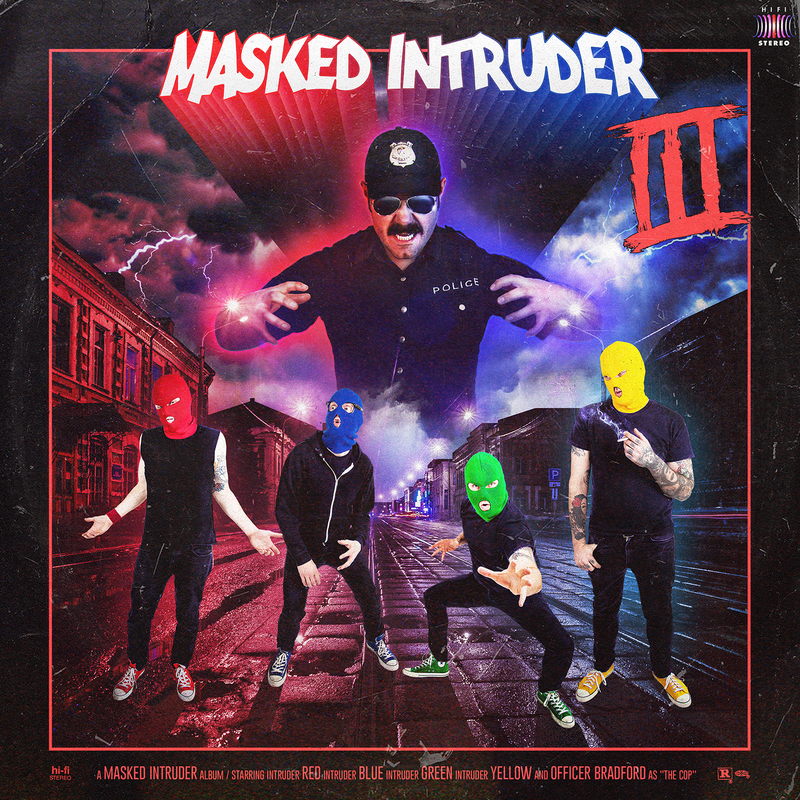 The new Masked Intruder album ‘III’ (titled as such as it’s their third outing) is basically what you could expect from them. Hooks, sing alongs, some pop punk guitars and a few references to them secretly being criminals. Opener ‘No Case‘ is a personal favourite and the first of four songs that throughout string together a little concept surrounding being criminals. It’s got a classic, grungey-punk riff and is just generally fun and catchy. ‘Just So You Know‘ continues the theme, a track that’s reminiscient of Bowling For Soup in its delivery, but is still easily identifiable as a MI track. ‘Maybe Even‘ has a classic, chugging pop punk riff and is an almost thought provoking listen in its presentation of love, while closer ‘I’ll Be Back Again Someday‘ concludes the mini concept with a track that almost sounds like it’s going to change the pace…then doesn’t. However, it is a welcome track with its passionate delivery, it’s catchy and a good closer following the two dull, water-treading tracks ‘Stay With Me Tonight‘ and ‘Dream A Little Dream‘. ‘Mine All Mine‘ feels like Busted meets The Monkees with its childish lyrics and sixties-esque backing vocals; it’s a signature MI track and a good follow up to the opener. ‘All Of My Love’ follows and, despite lowering the quality a little, is an earworm. ‘I’m Free (At Last)‘ was the obvious choice as a single as it has a summery vibe and is, again, remarkably catchy, with occasional deep lyrics that pass by almost without you noticing (talking about almost ending one’s life outright!) ‘Please Come Back To Me‘ is a pop rock love song and follows its predecessor well with its catchy melodies and dodgy but fitting lyrics. This vibe returns again on later track ‘Not Fair‘, which also messes with the Busted vibes present earlier in ‘Mine All Mine‘. It’s another amusing, catchy song with a teenage charm, and it’s relatable as hell. ‘B & E‘ attempts to have the same feeling but doesn’t hit home quite as well – it’s less bop but not a flop. Overall, I don’t think I’ve ever used the term ‘catchy’ more in a review of anything. Ever. But that’s the word that works best. It reminds us of early pop punk, when it was fun and not steeped in allegations of dodgy behaviour and songs about being sad. Even the songs here about being sad sound happy. In reality, it’s like a Bowling For Soup B-side collection – everyone sees musical and lyrical flaws but for some reason we can’t stop listening. Pop Punk Music, Punk Music.